Did you sell a plot of land? Land is a Capital Asset. 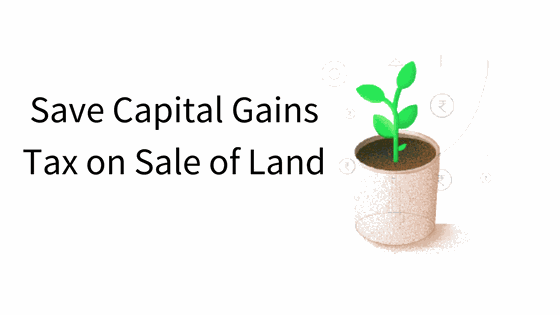 However, Agricultural land in a rural area in India it is not considered a Capital Asset, and therefore no capital gains are applicable on its sale. Before we find out how your capital gains shall be taxed, do make sure Income Tax considers your asset to be a capital asset. Is this a Long Term Capital Asset or Short Term? Once you are sure you have sold a Capital Asset. You will first need to check if this is a long term or a short term capital asset. Land is a short term capital asset when held for 36 months or less. If held for more than 36 months it is considered a long-term capital asset. To arrive at the Short Term Capital Gains – From the total Sale Price of the asset deduct cost of acquisition, expenses directly to sale, cost of improvements(if any) also deduct exemptions allowed under section 54(as applicable, we’ll see below what these are) – > the resulting amount is the Short Term Capital Gain. In case of Long Term Capital Assets, the only difference is, one is allowed to deduct Indexed Cost of Acquisition/Indexed Cost of Improvements from the sale price. Indexation is done by applying CII (cost inflation index). This increases your cost base (and lowers your gains) since the purchase price is adjusted for the impact of inflation. STCG are included in your taxable income and taxed at applicable tax rates basis your slab. See latest slab rates. (a) You purchase ONE house within 1 yr before the date of transfer or 2 yrs after or construct ONE house within 3 yrs after the date of transfer. (e) You do not purchase within a period of 2 yrs after such date or construct within a period of 3 years after such date any residential house (other than the new one). When you satisfy these conditions and invest entire sale proceeds towards the new house – you won’t pay any tax on your gains. However, if you invest a portion of the sale proceeds, the exemption will be the proportion of the invested amount to the sale price or exemption = cost of new house x capital gains/net consideration. Finding a suitable seller, arranging the requisite funds and getting the paperwork in place for a new property is a time consuming process. Fortunately, the Income Tax agrees with these limitations. If you have not been able to invest your capital gains until the date of filing of income tax return (usually 31st July) of the financial year in which you have sold your property, you are allowed to deposit your gains in a PSU bank or other banks as per the Capital Gains Account Scheme, 1988. And in your return claim this as an exemption from your capital gains, you don’t have to pay tax on it. However, you must invest this money you have deposited within the period specified by the bank, if you fail to do so, your deposit shall be treated as capital gains. What happens if you do not intend to purchase another property, there is no use of investing the amount in a Capital Gains Account Scheme. In such a case, you can still save the tax on your capital gains, by investing them in certain bonds. Bonds issued by the National Highway Authority of India (NHAI) or Rural Electrification Corporation (REC) have been specified for this purpose. These are redeemable after 3 years and must not be sold before the lapse of 3 years from the date of sale of the house property. You are allowed a period of 6 months to invest in these bonds – though to be able to claim this exemption, you will have to invest before the return filing date. The Budget for 2014 has specified that you are allowed to invest a maximum of Rs 50lakhs in a financial year in these bonds.